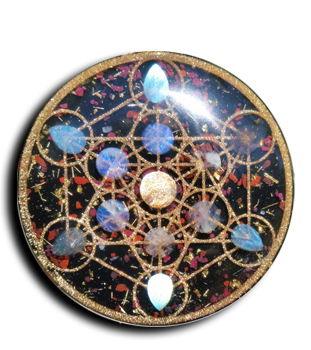 This pendant features a full spectrum show of color with an arrangement of Sunstone and 6 teardrop Moonstones over a Gold Seed of Life design that is inlaid with Opal. The Seed of Life is the most recognized symbol of all sacred geometry. This design captures the flowering and expansive energy of universal hologram to aid in opening the mind (3rd eye) to the unlimited possibilities contained within the soul’s journey around the Tree of Life.